The ecosystem of Madagascar, where ring-tailed lemurs are native, is a conservation priority for the Seneca Park Zoo, which has been raising funds and doing field work in the African island nation for decades. Recently, Party Mad at the Zoo and the Jungle Jog 5K both raised important funds for education and conservation programs in Madagascar. The Zoo Society’s docents also continue to partner with lemur expert Dr. Patricia Wright to fund and participate in research at the Centre Val Bio in Madagascar’s Ranomafana National Park. The Zoo Society’s One Cubic Foot initiative also made an impact there in May, replicating its citizen science project for two weeks with nationally renowned photographer David Liittschwager. Selma and 8-year-old Bradigan came to the Zoo in 2014 from the Bramble Park Zoo in South Dakota and Indianapolis Zoo, respectively. 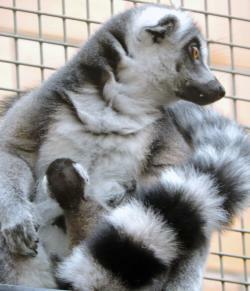 Ring-tailed lemurs are endangered in their natural range due to habitat loss and hunting. “We hope that guests coming to visit the newborn lemurs will be inspired to take action on behalf of the conservation of this endangered species,” says Zoo Society Executive Director Pamela Reed Sanchez.